One of my favorite pans is my much used carbon steel pan bought in Gourdon in the Lot in France about 20 years ago. I use it mostly for pan-roasting (or pan-searing). Carbon steel reacts to acidic fruits and vegetables and that's why one can never use tomatoes, lemons, or wine when cooking with it. I often do something very simple with the pan, namely, a nicely charred ribeye steak with a dollop of maitre d'hotel butter on top. Maitre d'hotel butter was a very popular compound butter about forty years ago, but it should be known by every competent cook. 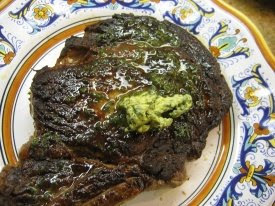 Blend together butter, parsley, and lemon juice and place a good-size dollop of it at room temperature on top of the steak. I don't know if you have any experience with Asian cooking but it's worth a shot to ask. I just bought my first carbon steel wok a few days ago and I'm not really sure how to deal with it. There were "preperation" and "seasoning" directions on the label but I'd love to know if you have any insight. Thanks.